W. Alexander & Sons Ltd.
W. Alexander & Sons Ltd Leyland Titan PD2/12 with Alexander lowbridge bodywork RB161 DWG 917, ‘Bus Lists on the Web’ have it listed as new to Alexander in 1952, ‘British Bus Fleets have RB160 DWG 916 listed at 1953, though not all of the batch are listed. But other sources on the web have it dated at 1954, clarification on this matter may prove interesting. 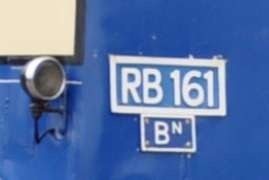 As can be seen below the RB161 fleet number plate is a small plate with the letters ‘BN’ which stood for the ‘Bannockburn’ depot. 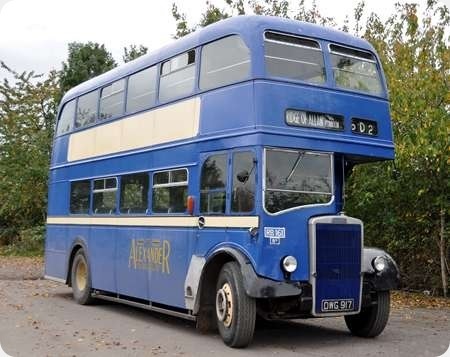 It is seen at A-Bus in October 2014 on a trip in connection with the Bristol Vintage Bus Group running day. This bus is not in Alexander (Midland) livery, but in the W. Alexander livery that existed until 1961 when the fleet was split into three – Midland, Fife and Northern. The fleet numbers were then prefixed with M, F or N respectively. This bus latterly ran in the attractive yellow and cream colour scheme of Alexander (Northern) and is seen in the attached photo along with sister NRB163 at Elgin depot on 6th September 1970, complete with E’ depot plate. I have changed the header and copy to remove the (Midland) part. W.Alexander & Sons Leyland Titan, DWG 917 was first registered on 4th June 1953. As part of the new vehicle licencing system the DVLA has a public website which shows if your vehicle is currently road taxed, it also shows when a vehicle was first registered, just google "vehicle enquiry service.gov.uk", enter your registration and chassis type to check if your vehicle is covered. Here is a view of DMS130. 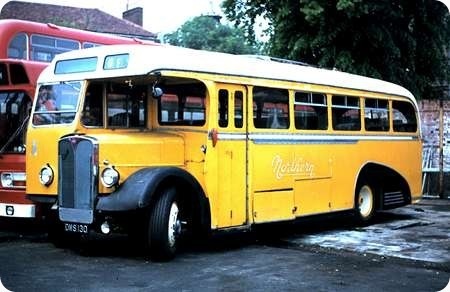 This AEC Regal III 6821A was new to W Alexander & Sons in 1951, with an Alexander C35F body as A104. When the company split, she passed to the Northern section as NA 104. She is seen in this guise in the yard of the Hants & Dorset depot in Southampton in May 1977. The then preservationists lived in nearby Bishops Waltham. This is one of six chassis ordered by James Sutherland of Peterhead immediately before their takeover by Alexanders in 1950. 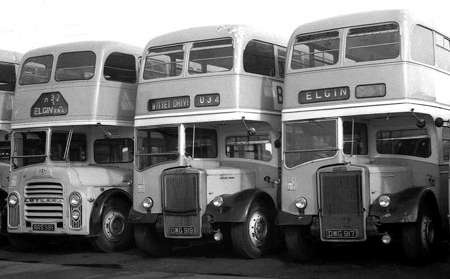 They were due to have Duple bodies similar to Sutherland’s six recently delivered Leyland PS1s which became Alexander PA197-202. However they were put to the back of the queue at Alexanders Coachbuilders and instead received some of their last halfcab bodies, 8ft wide on a 7ft 6in chassis, in a style also fitted to Alexanders 20 OPS2s. Duple was upset by this, so a number of Alexander pre-war Leylands were rebodied by Duple to fulfill the order.